It’s no secret that we Aleheads love the tremendous Pretty Things Beer and Ale Project, so it’s always a real treat when we see that the roving Cambridge, MA outfit has released a new brew. “Hops are bitter weeds of spite, That blunt the sugars, try to bite…” Dann and Martha promise. Mission accomplished. Bitter to the last drop, spicy, salty, glorious. A perfect example of the style with a bit of challenging je ne sais quoi thrown in for good measure. Notes: 22 oz. bomber from Charles Street Liquors. Hops: All UK-grown hedgerow or dwarf-variety hops: Pioneer, First Gold, and Sovereign. Style: “EXTREMELY bitter” English Pale Ale. Appearance: The State House dome without my glasses: golden copper hues; perfectly hazy. Head: Fluffy with outstanding retention. Lacing: Thick, unyielding; etched in glass. Nose: Beautiful balance of spicy, malty cereals, citrus, and caramel with an enduring, nutty finish. Taste: Very dry and very bitter; yeast wedding pepper, then cheating on it with the lawn across the street. Drinkability: Very high. The brew mellowed and expanded as it warmed; best enjoyed with food to cut the astringency. Rating: 3 hops. A wonderful offering from a great brewery. Posted in Uncategorized.Tagged Dwarf Hops, Pretty Things. So…I’m going to be a touch controversial here and go back on my earlier statements about Pretty Things infallibility. The first brew I tried from them was the ridiculously tasty February 27th, 1832 Mild Ale. It was a great concept that was perfectly executed and, as is often the case, that initial experience probably skewed my opinion of Pretty Things a little too highly. Since that first taste, I’ve had the St. Botolph’s Town and Fluffy White Rabbits (both pretty good), the Jack D’Or (decent), and the Field Mouse’s Farewell (nothing special). 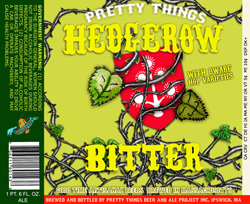 I’m starting to think that Pretty Things is a conceptually interesting brewery with cool marketing and beer names…but the actual beer they produce isn’t particularly noteworthy. Perhaps I’m alone in this thinking, but other than the Mild, I really haven’t been blown away by anything they make. Anyone else have this experience? I actually kind of hope I’m on an island on this one because I’d really like Pretty Things to be a successful outfit. I honestly do LOVE their approach. Dammit, Barley. Always the curmudgeon. I see your point, though I think Pretty Things is more than just the product of a cool idea marketed well. The beers I’ve had (which is all of them with the … sob … exception of Confounded Mister Sisyphus) have ranged from good to outstanding and have been noteworthy because they’ve defied my conception of styles. The Hedgerow Bitter is a good example. I lived in London and drank many (many) pints of bitter, but if they were brewed with dwarf-hops it’s news to me. No matter. I can re-learn the style courtesy of Pretty Things. Pretty Things is a class on ale taught by your favorite professor under your favorite tree during your favorite month. Did I just dub Dann Paquette Socrates? Perhaps. But somehow I don’t think he’ll mind. I think the issue is that I had them clumped with The Bruery in my mind (for reasons that make absolutely no sense). Perhaps because I first encountered both breweries at the exact same time. They’re both innovative, interesting, quirky ale factories that approach their professions in unique, engaging ways. But for my money, The Bruery simply has better offerings on a beer-to-beer basis. That’s not to say Pretty Things is bad…I just haven’t been “blown away” by them. So my last comment is probably unfair. I think I had just built them up too much in my head…no brewery could have met those lofty expectations.